From Searchservervirtualization, Virtual desktop infrastructure (VDI) is defined as the process of hosting a desktop operating system within a virtual machine (VM) running on a centralized server. VDI is a variation on the client/server computing model, sometimes referred to as server-based computing. The term was coined by VMware Inc.
One of the disk image formats supported by QEMU processor emulator is the Qcow/Qcow2. It is a representation of a fixed size block device in a file. Qcow2 is an updated version of the qcow format, intended to supersede it. The main difference with the original is that qcow2 supports multiple virtual machine snapshots through a new, flexible model for storing snapshots. Users can easily convert qcow disk images to the qcow2 format. We’ll cover steps of converting VDI to Qcow on the following host operating systems. Once qemu-kvm is installed, you can now convert vdi to qcow2. In my example, i will used vmdk image which i will first convert to vdi then do the conversion again to Qcow2. As you can see, i have VMDK file called box-disk1.vmdk, i will first clone it to VDI format then make qcow2 image. The following command is used to clone vmdk to vdi. The virtual appliance should be off. If it’s successful on cloning, you should see a vdi disk image file. Now lets convert VDI created to Qcow2 format using qemu. Basically what we are doing is converting vdi to a raw disk images. In case you would like to first create raw uncompressed image of format .img, here is how to do it. VBoxManage clonehd –format RAW ubuntu.vdi ubuntu.img NOTE: When you do convert a .vdi to a .img, The format .img file is uncompressed vdi and it will be the maximum size that you set your .vdi to grow up to, maximum size it can grow up to. That’s all.You are done doing any of above processes. 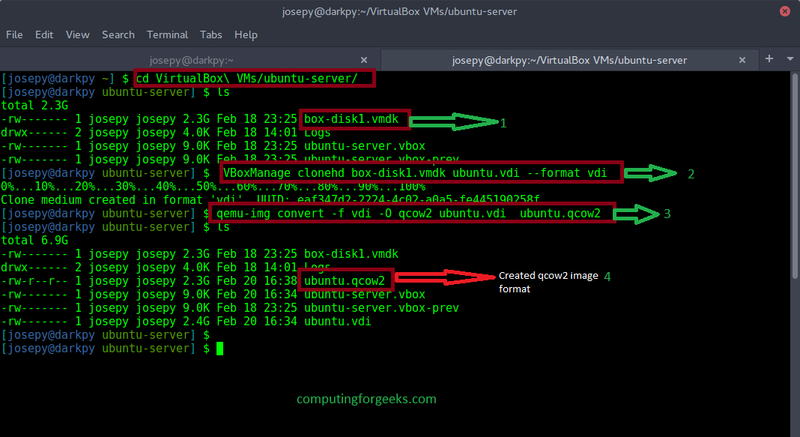 Converting vmdk to vdi to img to qcow2 in Linux , Windows and VirtualBox.